There are a lot of online storage services around the net, private or public. With this kind of services it’s pretty easy to save/share personal data. There’s a huge use of this kind of services, especially the ones that let you share files. They offer a free service (you often have a sort of Mb limit) and a fee service (no limit). I never tried uploading a file but I sometimes download files using Rapidshare, the most popular I think. Like every fee service it’s prone to phishing/fraud. I stumbled on a phish site just today when I wanted to download an archive. As always you click on a link and the initial Rapidshare page appears. Not this time. It’s an empty page with a definition of an iframe at the end. 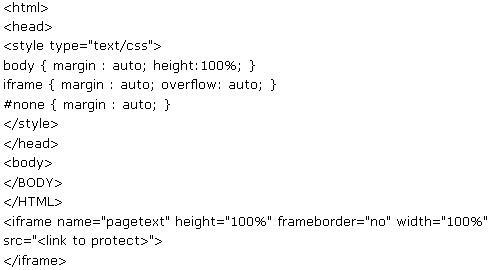 iframe tag is used to create an inline frame that contains another document. You can set one or more attributes (frameborder, height,name, width and src), I’m interested in the src attribute only. src is used to define the url of the document to show inside the iframe. From what I have seen that’s how protect-links protects a web page. This is only one of the services available around the net. In general, I don’t know why people need to protect a page with this kind of services btw. _orignal_url_ is the parameter passed to the php page and it represents the original rapidshare link. The image above represents an error message, it’s generally displayed when you don’t have a premium cookie saved on your system. This is not the common page I see when I want to download a file. Normally, the original page contains two boxes and it lets you decide to use a free or a premium service. Hitting the premium button without a premium cookie you get this kind of error message. The page is well defined, the design is like the original one but it’s a fake page. Inspecting some menu items you’ll see that they don’t have the same initial part of the url, they point to two different servers. Anyway, if you are a registered premium user and you see the error message you simply use your account to login… that’s the problem, when you hit the login button you won’t see anything else than a white page. The result is obvious, your data are now property of someone else. Can you understand why some people need to protect the link? Well, when a link has been protected you can’t see the original url… and you don’t know where you are sending your login details. This is an unfair use of the protector service for sure. What to do to protect ourselves from this kind of fraud? 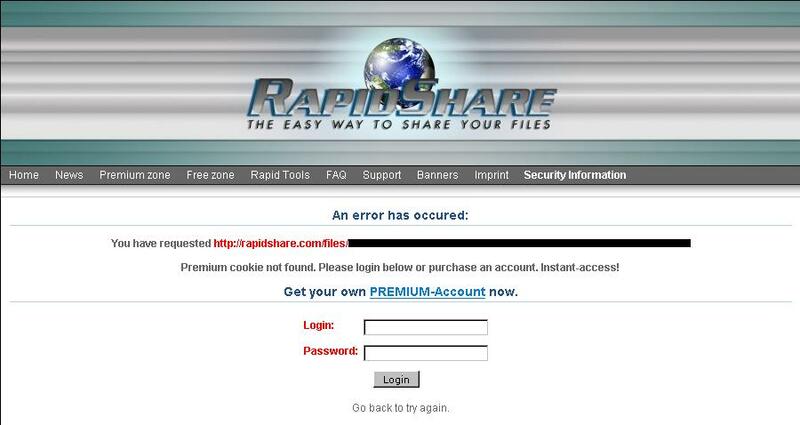 There’s a security advise at rapidshare.com, part of the text sound like: “Generally you should never enter your login information on any websites other than rapidshare.com. Your account information would most likely be stolen.”. That’s a good hint to follow! 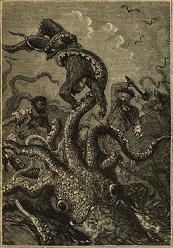 Kraken is the word of the month for sure, but it has nothing to do with the beast from an old nice book written by Jules Verne, Twenty Thousand Leagues Under the Sea. “One somewhat interesting feature of the code is that the binary is not packed, as many malware binaries tend to be. However, Royal said that the code does have some other forms of obfuscation that make it difficult to analyze completely.”. I decided to look at it. I’m not going to give out a detailed explanation about the sample I’m working on (MD5 = 592523a88df3d043d61a14b11a79bd55), but I’ll spend some words on the “forms of obfuscation” used by the malware. Detectors are not able to recognize any specific packer/protector. The file is not packed, but from the first lines of code it’s pretty easy to understand that a sort of obfuscation/encryption was included inside the file. I have not found interesting imports/strings, so I tried running the malware. Just to be sure to retrieve some useful information I started logging all API(s) called by the malware. The malware calls some nice functions. Almost all the code of the binary file has been decrypted at runtime. The malware spawns one file and it deletes itself, you can spy the decrypted code but I didn’t get anything useful from it. The best thing to do is to look at the code trying to identify a general obfuscation scheme or a decryption routine. Don’t think to trace the entire exe, it’s madness! In case like this one, if you are able to see a light over your head you are lucky, otherwise you can step and look at each instruction for the eternity. I was lucky… the real code has been hidden behind a virtual machine. I’m not a virtual machine expert for sure, I only read some articles about this kind of protection. I won’t rebuild the entire machine, I’ll give out my findings only. If you think they are wrong and/or you want to add some more information about the virtual machine I’ll be happy to see a comment from you. Everything starts from the value stored inside the buffer pointed by (esi-1), the buffer contains a series of bytes and they are used to select the virtual machine instruction to execute (Moreover they are used to retrieve one or more vm_instruction’s operand). The new value stored inside EAX (obtained after some minor operations) is used to retrieve a dword value, EAX represents the index of the vector that starts at 0x40FABB. As you can see from the code above the new value is used to obtain the address of the vm_instruction to execute. Unlike a classical virtual machine this one doesn’t have a clear Instruction Table, spying the dead list from your favorite disassembler you won’t see the address of every single vm_instruction. The Instruction Table has been crypted and the first entry is located at 0x40FABB (there are 256 entries). The virtual machine has 16 registers (from r_0 to r_15), they can be used to store byte, word or dword data. EDI register points to the first one, the registers are stored in memory consecutively starting from r_0 to r_15. The virtual machine has a stack with a fixed size, EBP register contains the vm_esp value. After almost all push vm_instructions there’s a stack overflow check. The alignment is two bytes, “push byte_value” is not allowed and to push a single byte the virtual machine will extend the byte to a word value. Is there a cmp/test instruction inside the snippet? Is there a reference to a vm_eip register? Seems like this virtual machine doesn’t need them. vm_eip is replaced by (esi-1), it’s not an eip per se but it *guides* the virtual machine. I haven’t all the vm_instructions on my notes but I think there are no direct cmp/test instructions. Seems like they are not included inside the virtual machine, strange. From what I have seen there are more than 45 vm_instructions included in the virtual machine, to identify each vm_instruction you have to remove a lot of junk code. Once you have all the vm_instructions it’s not immediate to understand what the malware is trying to do. Quite a simple patch operation, but the author didn’t use the straight way for sure. Believe it or not, this is the nature of the malware. Now you can understand the phrase: “Don’t think to trace the entire exe, it’s madness!”. According to Intel Manual’s opcode map 0x6E is defined as “OUTS/OUTSB DX, Xb”. The first operand is DX register, and the second one is defined as an “Xb” operand. The error is obvious, Ollydbg shows EDI instead of ESI. It’s an oversight on X and Y addressing method. The errors occour in v1.10 only, v2 shows the right instructions. I asked to Olly (Oleh Yuschuk) and he kindly replied: “Unfortunately, I will not correct it in 1.10…This project is closed, and I don’t want to make any modifications.”. Ok, I’ll switch to v2. IDA disasms reserved opcodes, is it a bug? The first thing I thought of was: “Damn, there’s a bug inside my disasm engine”. I took a look at the printed version of my “Intel® IA-32 Architectures Software Developer’s Manual – Volume 2B: Instruction Set Reference, N-Z”. According to one-byte opcode map, C6 opcode is defined as a “Grp 11 (1A) – MOV”. This is only a part of the entire table, it shows the header and the row of the group I’m focused on. ModR/M byte is divided into 3 parts: mod, nnn and r/m. These numbers help you to locate the right instruction definition into the opcode extension’s table. To make things short, nnn value identifies the right cell to pick out. In this case 100b points to a blank cell, what does it mean? According to Intel manual: “All blanks in all opcode maps are reserved and must not be used. Do not depend on the operation of undefined or reserved opcodes“. Is it really an invalid instruction? All my initial investigations were done using the printed version of the Intel manual, and since of I had found some errors in it I decided to look at the most recent online version. This new check doesn’t change anything, seems like IDA is able to disassemble an invalid instruction. Weird. The result is the same, it’s an invalid instruction. According to Ida it should move a byte inside 0x4010B2 address (it has full access) showing a simple messagebox, nothing more. Unfortunately the result is not the same. If you run the file without a debugger it crashes and the classic error box appears. Spying inside the message error’s box I see that the error occours at offset 0x1005, C6 opcode! If you run the file with Ollydbg you’ll get almost the same result, the debugger stops signalling the error “Illegal instruction” at 0x401005. Again, C6 opcode! If you run the file using IDA’s debugger you’ll get a simple warning: “An attempt was mode to execute an illegal instruction (0x401005)”. After that you’ll get a sequence of error boxes, seems like Ida’s debugger is not fully able to handle execution of illegal instruction…this is another story, btw. I did some more test and seems like the problem occours with all the *blank cells*; I tried with all the possible C6 combinations and with some different opcodes too. The result is always the same, Ida shows a disassembled instruction which is totally wrong!!! I tried reading Ida’s help file but there was no mention about the problem, I don’t think there’s an hidden option to set. I tried googling without luck. Due to this fact I’m not 100% sure but… I think it’s a bug!